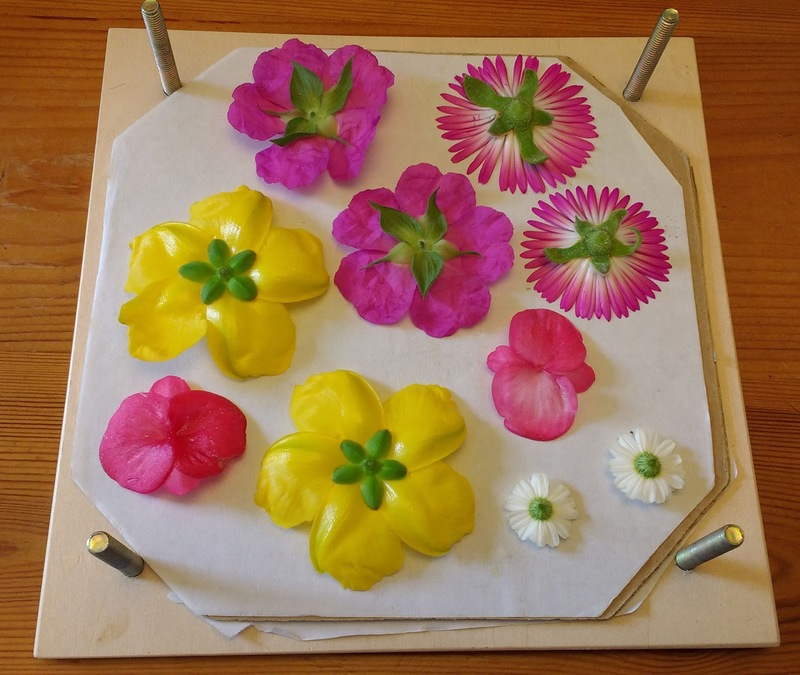 This year I felt a yearning to press flowers; to preserve them in time from their very peak of splendour. 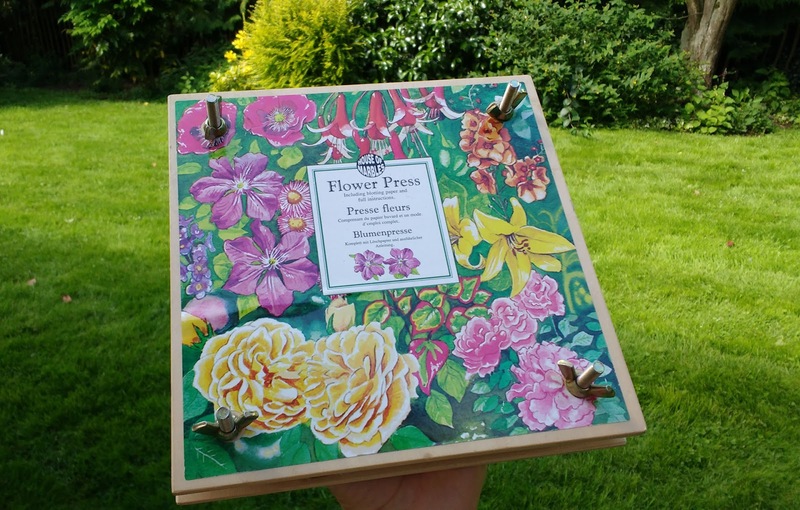 This cheap and cheerful flower press was a charity shop by from a while ago. I presumed it had been unused but some of the sheets were a little less than perfect which annoyed me a little but I suppose I should have checked. I'm unfamiliar with blotting paper aside from reading about it in Enid Blyton's books as a child. The garden itself didn't appear to have all that much to offer in terms of flowers on initial appraisal but I took my time, carried my little trug and scissors an set about finding two of each flower in perfect condition. The most obvious thing I tried to remember was that they needed to be fairly flat flowers. 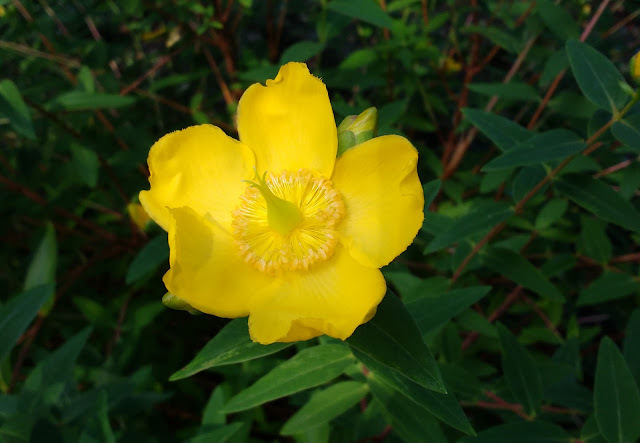 Upon closer inspection of the hypericum flowers I noted that the central nobbly bit would be problematic. So I cut it off and hoped for the best. 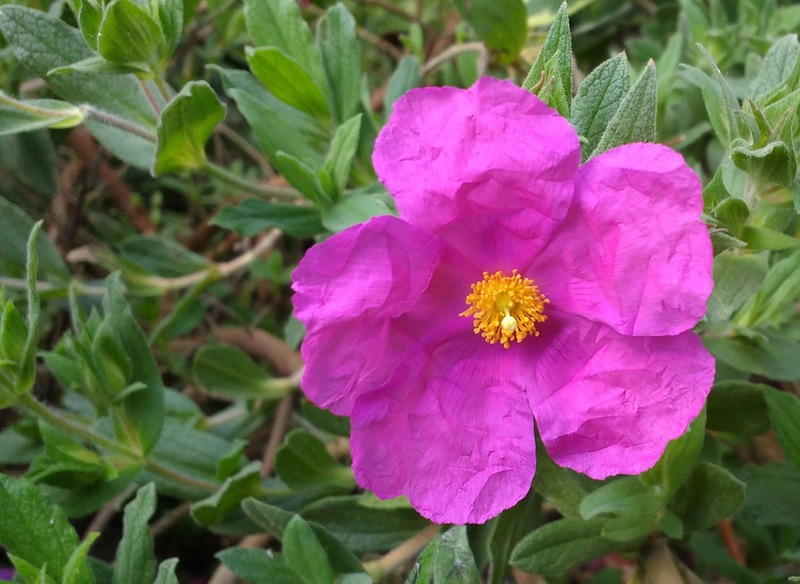 These cistus 'rock rose' has the most amazingly paper thin, delicate flowers. I'm suspecting these may perhaps be too delicate to survive a pressing but let's wait and see. 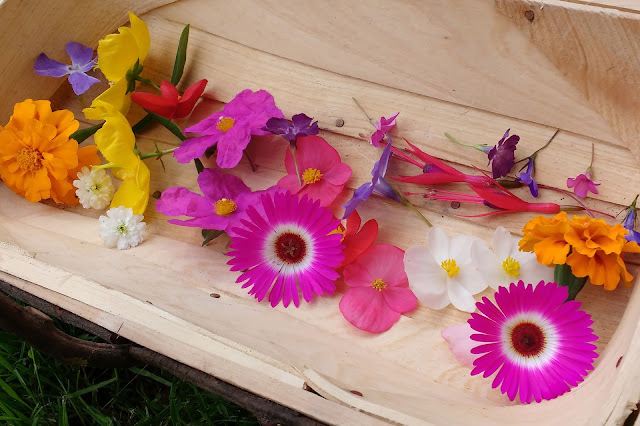 After a while of gently collecting two flowers of each kind, I was thrilled with the collection I saw before me; such pretty colours and so many shapes. All those perfect little tokens of joy. 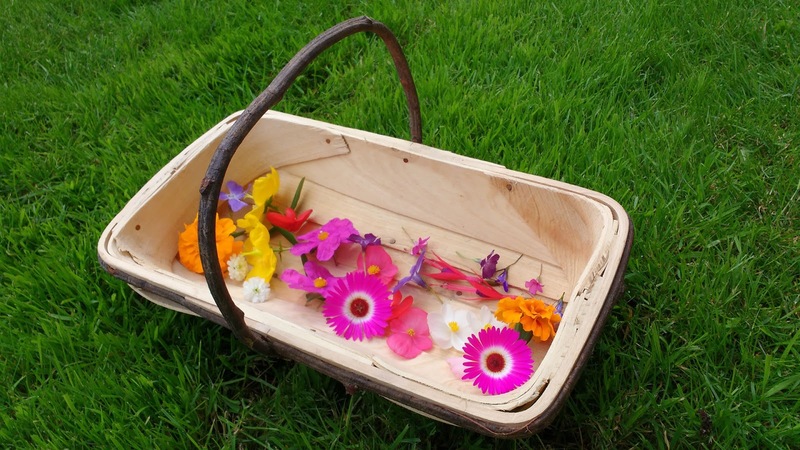 You notice that I have marigolds in the basket, but it became apparent that they had no intention of being pressed. (I shredded one in the course of essential trimming, so the other was popped in a tiny vase of water where it's still going strong six days later, so not a total waste). I saw some fuchsias on an adjacent bush so I borrowed two. I have no idea how well each one of these may work, so it is a complete leap into the unknown. But I'll know for next year. In accordance with the minimal instructions on the press, I picked the flowers when they were dry and laid them face down on the blotting paper, carefully trimming down the stalks as much as possible. I had enough for two sheets, the second would have been full if I could find a second perfect pale pink begonia but it wasn't to be. I have a few more layers I could add to as and when I find more flowers but for now I have tightened up the press and put it in the airing cupboard. Tightening the screws a little more this week before leaving it around 3 weeks before unveiling the results. 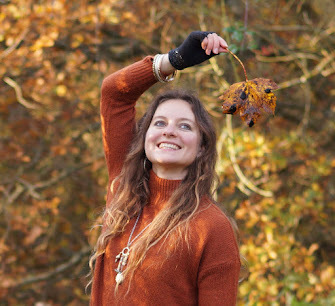 I have to say, this was such a lovely thing to do. If you don't have a press, you can use heavy books instead. A lovely way to spend a little while on a sunny day. I had a press very much like this when I was little. Used to press anything and everything! Looking forward to seeing the results. What are you going to do with them when done? Your flowers you chose are incredible!!! Sooo pretty!!!! I love those pink ones, what joy!! I love the range of colours you have chosen. 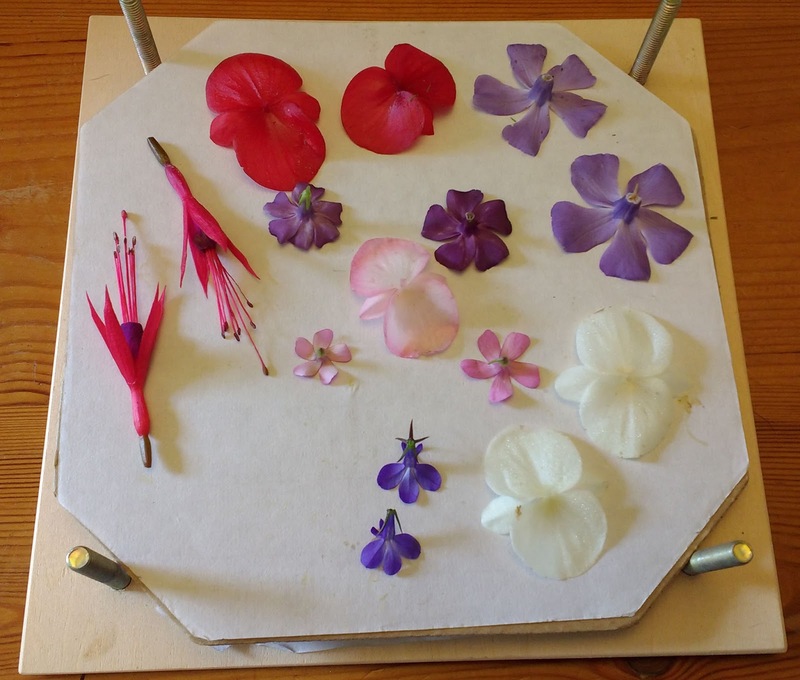 I have been known to press flowers in books but never do anything this extensive.